Each year we gather together an all-star panel for our annual Advanced Appellate Conferences and this Audio Package Bundle is comprised of the recordings and materials from our First and Second Annual Advanced Appellate Conferences held in Seattle in 2016 and 2017. The faculty at these two seminars include sitting and retired Washington Supreme Court Justices, sitting Washington Court of Appeals Commissioners and long-time appellate practitioners. These seminars delve into the advanced topics that are rarely touched on in full-day CLE courses, and many of the topics are proposed by members of the court, to address issues they feel are important to attorneys at the appellate level. These programs are intermediate to advanced-level courses that give you a behind the scenes look at critical components of your appellate cases and includes in-depth discussions on tricky topics like raising new issues on appeal. At our First Annual Conference, faculty discussed tricky ethical issues (and ethics credit is included), brief writing and oral argument strategies and advanced issues related to preserving and presenting the record. Someone from the court gave an appellate law and technology update, including discussing the E-Filing Portal, RAP Changes, and conventional wisdom about digital documents. Faculty also discussed raising new errors and presenting new evidence on appeal, including Rules 2.5 and 9.11. The speakers discussed in detail issues and strategies related to settlement on appeal as well as rehearing & requests to publish advice. The final session of the day was taught by a sitting Supreme Court Justice and delved into practice before the Washington State Supreme Court. At our Second Annual Conference, faculty discussed Motions for Discretionary Review and Petitions for Review, Amicus Curiae briefs, dealing with clients and trial attorneys, and gave a behind-the-scenes look at the Appellate Courts. Faculty again gave the latest technology update related for an appellate practice related to what the court wants and expects and will refuse. The also discussed new ethics issues (and ethics credit is included as well). A different discussion related to special brief writing and oral argument issues was also included. You can see detailed agendas under the What You Will Learn tab. “My personal objectives were well satisfied and I have done a lot of appeal work.” – Jerome C. Scowcroft, Esq. To purchase the 2016 1st Annual Advanced Appellate Audio Recording Package only, you can go here. To purchase the 2017 2nd Annual Advanced Appellate Audio Recording Package only, you can go here. Catherine W. Smith is a principal of Smith Goodfriend, P.S., where her practice is limited to civil appeals and appeal-related matters. Catherine is a founding member and was the first President of the Washington Appellate Lawyers Association, a former President of the American Academy of Appellate Lawyers, co-editor-in-chief of the Washington Appellate Practice Deskbook, and an elected Fellow of the American Law Institute. Catherine received her BS from Oklahoma State University and her law degree from the University of Washington School of Law. She has handled over 400 appeals in Washington state and federal courts. Dahlia Lithwick, reporting in Slate magazine on argument in the U.S. Supreme Court of Troxel v. Granville, declared, "She is one of the finest oral advocates I have ever seen." 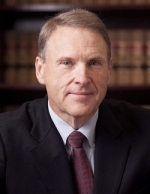 John A. Strait, Emeritus Professor of Law and Professional Ethics Counsel, is a graduate of Yale Law School. Professor Strait has served on the Washington Supreme Court’s Judicial Ethics Advisory Committee, the King County Bar Association Campaign Ethics Committee, the WSBA Rules of Professional Conduct Committee, and the board of the Washington Chapter of the American Judicature Society. He serves on the board of the WSBA Criminal Law Section, and has served as a governor’s appointee to the Statute Law Commission. He serves as Adjunct Investigative Counsel to the Washington State Bar Association Office of Legal Discipline. The clinical component of his course in professional responsibility investigated complaints against lawyers for probable cause for the Washington State Bar Association from 1991-2005. The law school received the E. Smythe Gambrell Professionalism Award from the American Bar Association for the clinical component. Professor Strait served as a member and Chair of the Seattle Port Authority Ethics Advisory Commission from its inception until 2009. Professor Strait joined the faculty in 1974. He is the 2017 WACDL William O. Douglas Award recipient for Extraordinary Courage and Dedication to the Practice of Criminal Law. He is a frequent CLE presenter on legal ethics. Purchase this Bundle now to save $250! Audio Recording & Materials Packages CD Format: $600, plus $7.50 shipping and, in CA, sales tax. If you ordered each conference separately, you would pay $850. Save $250 and order the bundle today. WA: The First Annual Advanced Appellate Conference Recording in this Package is approved for 5.5 CLE units and 1.0 unit of ethics credit in Washington, through June 2, 2021. WA: The Second Annual Advanced Appellate Conference Recording in this Package is approved for 5.5 CLE units and 1.0 unit of ethics credit in Washington, through June, 2022. CA: Both programs are approved for 6.5 general CLE units and Certified Legal Specialist in Appellate Law CLE in California, including 1.0 units of ethics.